Opponents of the proposed Pebble Mine argue that it could have far-reaching environmental impacts that could alter the Bristol Bay region’s pristine ecosystem — and local residents’ livelihoods. Going back centuries, Bristol Bay’s backbone has been salmon. With few stable year-round jobs, subsistence — defined by Alaska’s Department of Fish and Game as “noncommercial customary and traditional uses of fish and wildlife” — is the most consistent and reliable part of the local way of life in rural Alaska. The state recognizes the cultural and economic value of native traditions of living off the land in a law known as “subsistence priority,” which protects “reasonable” opportunities for subsistence living over commercial or recreational fishing and gaming. Both the state and federal government have rules regulating the practice in rural areas, including seasonal and bag limits and restrictions on wasteful taking. About 17 percent of Alaskans — or 120,000 people — live in rural areas, where 95 percent of households use fish and 86 percent use game for subsistence purposes, according to James Fall, the state-wide program manager for the Department of Fish and Game’s Division of Subsistence. The department says there’s “little evidence” this traditional way of life is disappearing. Research from the Division of Subsistence (PDF) shows that fish is the most commonly harvested subsistence food in the state. 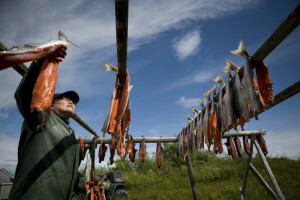 In Bristol Bay, about 50 percent of the local subsistence harvest is Pacific salmon (PDF), mainly sockeye, and 10 percent is other fish, including halibut, herring, whitefishes, cod and Arctic char. Land mammals, including moose and caribou, make up about 20 percent of the state’s subsistence harvest; marine mammals make up 14 percent; and birds, shellfish and wild plants account for 2 percent each. Subsistence living can also include using trees, like spruce, birch, hemlock, willow and cottonwood, for house logs, furs for clothing and wood for fuel. 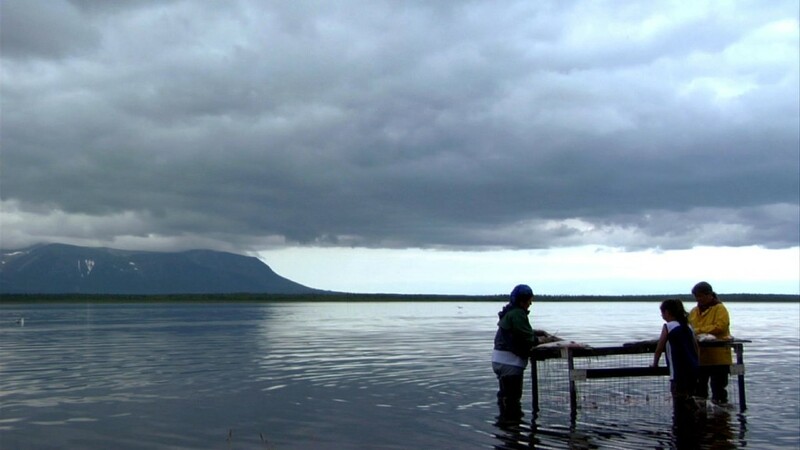 Today Bristol Bay residents rely on a combination of cash-based economies and subsistence. A report on Bristol Bay (PDF) from the Alaskan Department of Fishing and Game estimated in 2005 that the cost of replacing wild foods in the region — based on buying meat at a local store or importing meat — would range between $4,851 in Levelock to $14,973 per household in the Iliamna Lake area. In the excerpt from Alaska Gold embedded above, 75-year-old Bristol Bay native Mary Olympic explains how generations of her family have relied on the local ecosystem to sustain them. But some supporters of the Pebble Mine argue the tradition of living off the land is no longer sustainable.